It was around 7:00 on Sunday, June 24th when I stretched and got up out of bed. It had rained again last evening a bit and then overnight, a seemingly significant amount. The rain pails at the edge of the Suite run-off were about half full so I assume that the rain barrel level has also increased. I made my tea and sat in my recliner to finish my book. Bill joined me around 7:30, made his coffee and we chatted about some projects. Today wasn’t going to be conducive to working outside, at least not until later this afternoon when we may see some sunshine. Bill wasn’t fond of the cookies I made, not surprising since they included not only his favourite item (peanut butter) but one of his least favourites. (banana) I didn’t mind them but put them in a baggie in the freezer to take to our family reunion in July. Today, I’ll make him something he will like. Bill and I both like the regular Kraft smooth peanut butter and stock up on it from Costco before we head south. They don’t carry Kraft in the southwestern states. When Marilynne began packing up things from their apartment, she offered Bill 2 jars of Kraft's natural peanut butter. You know, the kind with the oil on top and nothing else added? This would not be something Bill would enjoy by itself on a sandwich, so we will use it in cookie and smoothie recipes. With my book and my first tea finished, the rain has petered off for the moment. I decided to start getting ingredients out rather than waste any time sitting here. I wasn’t planning anything outside today anyway. I made a couple of Peanut Butter ball recipes, the first one with just a bit of honey. The second one called for a fair bit of icing sugar, so more sweet, with cherries and nuts. It is one way of knowing what recipes to keep on hand and which ones I can get rid of. I have w-a-a-a-y too many. Bill worked outside in his cargo trailer, out of the rain. Things to do with his planes that I don’t keep track of but I do know he replaced a prop on one. Everything is looking so green after the rain but I’m happy to see that we are expecting some dryness and sunshine tomorrow. After baking, I hopped into the shower and when Bill came back in I gave him a taste of the two cookies I made. Both were a hit so those recipes are keepers. Donna and Gerry asked us if we could get our paddle boat moved from the Acreage as they are in clean up mode before our family gathering. We had left it there because the pond here is too weedy to put it in. It actually isn’t usable right now anywhere, well it is but it has a leak underneath where the props/paddles are. It is one of those projects that Bill has on his list. So many things, not enough time. When the rain stopped after 1, we drove over to pick it up. Now he can work on it when he has time to do it. Meanwhile, it will be out of their way over there no matter how long it takes. We hadn’t heard from our buddies for a couple of days so I sent a text off to them to check in. We feel very comfortable with our communication back and forth, not for one-minute feeling that we are invading their space and I hope they feel the same way. They should know that they are welcome to contact us or visit anytime. Bill began working right away on disassembling the paddles on the boat. He has to remove those before getting to the cracked hull. Can you see the large crack through the grime? I imagine he’ll write about his process so I won’t say too much and spoil his post. The sun popped out for a few lovely minutes, just like the forecast called for but now at 4:20, there is a huge gray cloud moving overhead. I took pictures of the garden, are you sick of seeing it yet? I’m not! I’m so proud when I can grow things, especially food stuff. The onions are getting bigger but there were still 6 that had a mate sharing the same hole, so I pulled those smaller ones out to make room. They were still a nice size and I will use them along with chives for salads and cooking. I washed and sliced potatoes, washed and chopped green and cooking onions. Tonight, we are having mild Italian sausage and cheesy scalloped potatoes. I wasn’t sure, and at this point I’m still not, if we will be able to cook outside on the Weber so planned inside spuds and an easy meat to cook inside or outside. On cue, there is the sunshine back again. Potatoes are in the convection oven for an hour and I started them early as they are never done, ever, in the amount of time the recipe advises. In any oven. That’s my experience and I like the potatoes to be tender. While I was putting the ingredients together, I munched on some cheese and had a beer margarita. That went down too well! Clemson has been doing a bit of shivering again but nothing major. We don’t know if it is a chill or if he is just excited each time going in and out. Anyway, he is fine and goes from a little old man sound asleep in his bed to a young playful puppy when he is outside with us. We enjoy watching his antics on a daily basis. Right now, he is in a sitting position in his bed but his eyes are closed. 😊 I imagine one day, I’ll be doing that myself! we have the means to wash many things! 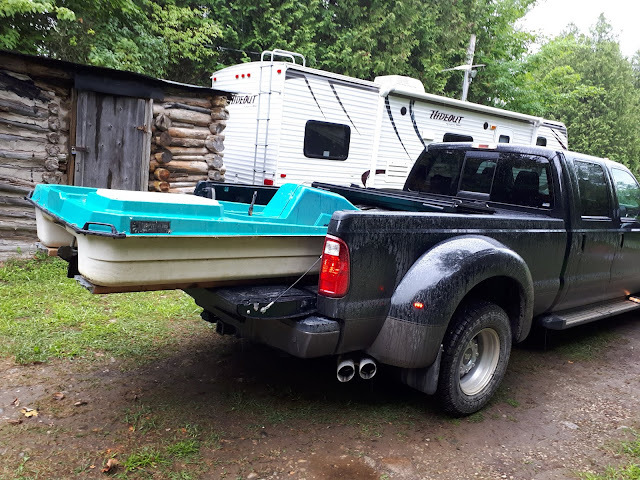 Bill wanted to wash the paddle boat’s underside so he can work on it and drove Black Beauty over to the Acreage once more to fill the water bladder. The pressure washer will do a nice job cleaning it up. I took a walk down the lane while he was gone and later, after he returned, Clemson followed my hand signal “come with Mom” to go for another walk. It really has been a pretty decent day at a pretty steady 66F/19C. The Goose families seem to be over at our neighbour’s today, either in their front or back field. Soon those babies will be striking out on their own. I can hear them now. “Can I fly out tonight?” Not too much activity in the Ridge area today though. After saying that, Bill came in and told me that on his drive down the lane, 2 Mrs. Yertles were digging holes, a Goose family scurried out of the dock area, Peter Cottontail (his words) dodged quickly between his tires and somehow managed to survive. Oh, and a mouse scuttled across the road ahead of him. Now, tell me what is wrong with this very deep hole? I retract my earlier comment that we didn’t have much activity here today. On my walk, 2 more, or the same, Mrs. Yertles were busy again. Lots of holes that I see no problem with but then, I’m not the one laying the eggs. I never really know if she ever finds the perfect spot, digs the perfect hole and lays her numerous eggs. I haven’t seen any teeny babies this spring and they would have been hatched long ago. Bill finished doing the clean up of the boat and then moved on to Black Beauty. She was looking pretty brown after the drive down the wet country roads. There was enough water in the bladder leftover to do a fast wash down. Now, that looks better! While he did that, I barbecued our sausage, cooked some corn and baked the potatoes for the last 15 minutes after adding a cheddar and crushed cracker topping. When it all came together, we enjoyed the meal. The potatoes were perfect but maybe I could have removed the sausage a minute or so earlier. 😊 With dishes cleaned up, Bill went back outside for a while. I sat at my laptop to finish today’s post. The sky is still semi-cloudy and semi-sunny so a mixed bag. It has been a good day, with more things taken care of. I’m into a new book by David Baldacci called The Escape and it is starting off with a bang. I’m sure I’ll be deep into it before the night’s end. I hope you have enjoyed your day and are looking forward to a sunny one tomorrow. Mary Mary quite contrary, how does your garden grow?? It looks great!!!!! Hope Mrs Yertle finds her spot soon!!! A rainy day is nice to get some inside things taken care of and get your garden growing. Yes a nice rain for sure. It did turn out to be a nice afternoon after the much needed rain. Your scalloped potatoes sound good, I haven't made them for a long time. You should be proud of your garden....I know how hard it is to grow anything in the rocky ground of Glenelg. Thanks for moving the paddle boat. That spot has been an area that has needed cleaning up for awhile. We can get at the rest of the stuff hidden in there now and clean up the wood pile. we can look after the boat. Anything w peanut butter works for me..everything you made looks awesome! Your garden looks wonderful, love seeing it grow! Paddle boat would be fun, too bad it doesn't work on your pond. I'm sure Bill was happy to get the dirt off of Black Beauty..looks good! Dinner looked great too..those potatoes look yummy!